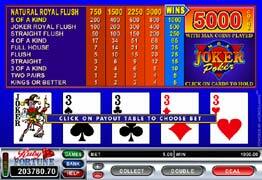 The following are variations of video poker available at many online and physical casinos today. In Cyberstud Poker, you are dealt a hand of five cards and the dealer is dealt one card facing up. Based on the value of your hand and the dealer's upturned card, you must decide to either increase your bet to maximize your winnings, or to fold to minimize your loss. If the dealer's hand qualifies, that is, contains an Ace-King pair or better, and you choose to call and not fold, you will be paid out according to a schedule based on the value of your hand. Progressive Cyberstud Poker is based on standard Cyberstud Poker, and has a side bet that makes you eligible for additional payouts. One of which is the Progressive Jackpot. In Progressive Cyberstud Poker it's you against the dealer! The object is to beat the dealer's poker hand. A Royal Flush will win the Progressive Jackpot. Unique pay lines on pay table for different four-of-a-kinds. Double Joker has 54 cards in the pack, instead of the normal 52 cards. The extra two cards are Jokers which are wild cards that can substitute for any other card, of any suit and denomination, to complete winning combinations. When you are dealt a Joker the computer will automatically assign a suit and value to that card, giving you the highest possible payout for the cards that you are holding. 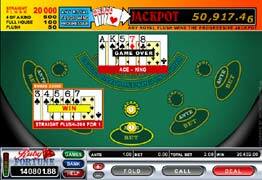 Special pay line in the pay table for 4 Aces, eights, or sevens. The name of the game “Joker Poker” refers to the fact that there are 53 cards in the pack used in this game, instead of the normal 52. The 53rd card is a Joker, which acts as a wild card. Whenever you get the Joker, the computer will automatically assign a suit and value to it to give you the highest possible payout in light of the other cards that you are holding. Enjoy it! 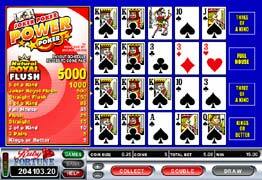 Joker Poker Power Poker is different from the standard Joker Poker video poker as you play four identical hands of cards. At the beginning of each game only the first hand is shown to you, while the other three hands remain face down. The game then progresses like a standard video poker. Joker Poker Power Poker has 53 cards in the pack, instead of the normal 52 cards. The extra card is a Joker. 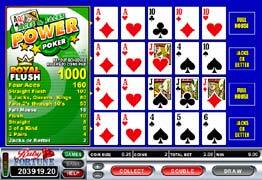 Double Joker Power Poker is different from the standard Double Joker video poker as you play four identical hands of cards. At the beginning of each game only the first hand is shown to you, while the other three hands remain face down. The game progresses like a standard video poker. 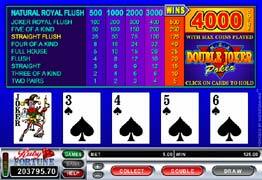 The highest hand you can get is a Natural Royal Flush and it pays out 4000 coins, with five coins bet. 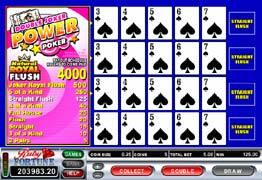 Aces and Faces Power Poker is different from the standard Aces and Faces video poker as you play four identical hands of cards. At the beginning of each game only the first hand is shown to you, while the other three hands remain face down. The game progresses like a standard video poker. 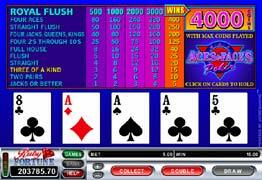 The highest hand you can get is a Royal Flush and it pays out 4000 coins, with five coins bet. The object of 4-Line Aces & Faces is to obtain a five-card poker hand that contains a winning combination. It differs from original Aces & Faces, since it has four lines of cards. Choose the value of the coins you wish to wager each round, by clicking on the + and – buttons on the right. Click Bet One or Bet Max to select the number of coins you wish to wager. Each click on the Bet One button increases your bet by the value of the coin you selected. Pressing Bet Max increases your bet to the maximum amount possible – that is five coins – and deal the cards automatically. You can also click the appropriate column on the winnings table to specify your bet size. The bet size you choose is per one line. Since there are four lines of cards, four times the amount is subtracted from your account balance. Your total bet amount is shown in the lower right corner of the screen, after the label “Bet”. Click Deal (if you did not press Bet Max). Choose which cards you wish to keep by pressing the Hold button underneath the card, or by clicking on the card itself. Click Deal to replace the cards that you did not choose to hold. If you end up with a winning hand, you can accept the winning (press Collect), or you have the option to double it. Should you choose to double, the dealer draws an open card and you are given 4 unexposed cards to choose between. If you choose a card that is lower than the dealer's, you lose your original winning. If the cards are equal, it is a tie, and you have the option to collect your original winnings (press Collect) or double again. If your card is higher, you win double the amount of your original winnings. You then have the option to collect your winnings or double even further. You can also choose to Half Double, which means you only double for a half of your winning amount. You cannot double, if your winning amount exceeds $2000. Bet all five coins with one click and deal cards automatically. Bet one to five coins (click one to five times). Click Deal to receive your cards after that. Deal your cards and replaces the remaining cards after you have selected which cards to hold. Selects the cards you want to keep. You can also click on the card itself to hold it. Click this button to see the pay table Click it again, to make the pay table disappear. See the game history - dates, bets and results of your previous game rounds. You cannot use the chat feature to chat with other players, since the machine games are not played in multiplayer mode. However, you can answer the casino administration, in case they start a dialogue. Open the help file (which you are reading right now). Open the Options dialog box – see the Options section of this help file. Press this to exit the game and go back to lobby. You can’t exit in the middle of a game round. To calculate the winning amount for a card combination, multiply your bet per line by the number shown in the winnings table in first column from the left. Columns 2-5 are for reference purposes – when you bet two coins, the winning amount doubles; when you bet three coins, the winning amount triples, etc.